Theatre Royal Winchester is excited to announce it has won the award for Best Family Entertainment in Hampshire, in the Hoop Awards. In February the theatre asked the public to vote for them in this category in the Hoop Awards, which celebrate the country’s best organisers of family activities, who ‘go above and beyond to entertain, educate and inspire children nationwide’. Over 100,000 votes were cast in this year’s awards. Over the past year the theatre has delighted children – young and old – with a wide range of fun and educational shows including The Gruffalo’s Child and Teletubbies Live, and this Easter it is hosting The Amazing Bubble Man, David Baddiel’s animal magic musical, AniMalcolm – about a young boy’s eye-opening school trip to a farm – and science show Brainiac Live!, where exploding dustbins and daredevil stunts are expected – as well as many others. 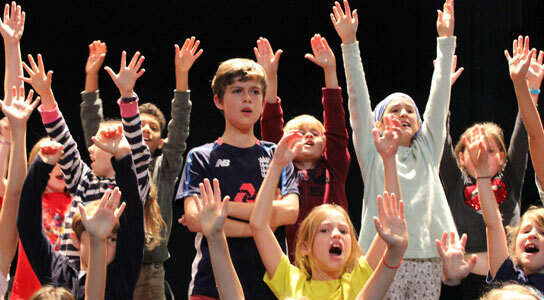 The theatre also runs popular Youth Theatre, Young Theatre Royal, as well as children’s workshops and summer schools where young people can come and explore their creative side and rehearse and perform their very own shows on their stage. The Theatre Royal Winchester is run by the Live Theatre Winchester Trust, a registered arts and education charity based in the heart of the historic city of Winchester, Hampshire. The Theatre Royal Winchester is a 400 seat, mid-scale, mixed genre receiving house situated in the centre of the city. The theatre regularly welcomes over 70,000 visitors and promotes over 230 professional performances per year. The artistic mix is wide ranging and includes drama, physical theatre, dance, children’s theatre, comedy, music and talks. The Live Theatre Winchester Trust also presents Hat Fair – the UK’s longest running festival of Outdoor Arts.